Free – public invited. For more information please call (386) 427-6975. 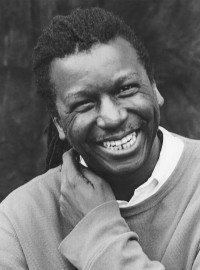 Poet/Playwright/Songwriter Cornelius Eady was born in Rochester, NY in 1954, and is Professor of English at SUNY Stony Brook Southampton, where he is the Poetry Editor of the Southampton Review. He is the author of several poetry collections: Kartunes; Victims of theLatest Dance Craze, winner of the 1985 Lamont Prize; The Gathering of My Name, nominated for the 1992 Pulitzer Prize in Poetry; You Don’t Miss Your Water; The Autobiography of a Jukebox; Brutal Imagination, Hardheaded Weather (Putnam, 2008), and the anthologies Every Shut Eye Ain’t Asleep, In Search of Color Everywhere, and The Vintage Anthology ofAfrican American Poetry, (1750-2000). He wrote the libretto to Diedra Murray’s opera Running Man, which was short listed for the Pulitzer Prize in Theatre, and his verse play Brutal Imagination won the Oppenheimer Prize for the best first play from an American Playwright in 2001. He is also a singer/songwriter, with four chapbook/music CD’s from Kattywompus Press: Book of Hooks (2013), Singing While Black, (2016), Field Recordings, (2017), and All the American Poets Have Titled Their New Books The End (2018) He holds a PhD in the Arts (Hon) from the University of Rochester (2010). His other awards include Fellowships from the NEA, the Guggenheim Foundation and the Rockefeller Foundation, a Lila Wallace-Reader’s Digest Traveling Scholarship, and The Prairie Schooner Strousse Award. He is co-founder and Vice-President of the Cave Canem Foundation, and was, before returning to Stony Brook, The Miller Family Endowed Chair in Literature and Writing and Professor in English and Theater at The University of Missouri-Columbia.